I just couldn’t do it. I couldn’t catch Forza Motorsport 7’s simulated driver. He threw his Porsche 918 Spyder around the corners so well, his lines so perfect, that I just could not close the gap between us. But then, it started to rain. Fat drops of it landed on my windshield as the tiny storm evolved into a downpour. The drenched track shimmered with puddles. Up ahead, the Porsche’s tires squiggled in the wet and, little by little, I started gaining on it. Turns out I’m good in the rain, at least here. Weather in the game is like it is in real life; unpredictable, natural and very palpable. It’s the difference between a win and a second place finish for those who know what they’re doing behind the wheel. And that’s one of a million little details that make the latest Forza game such a standout. 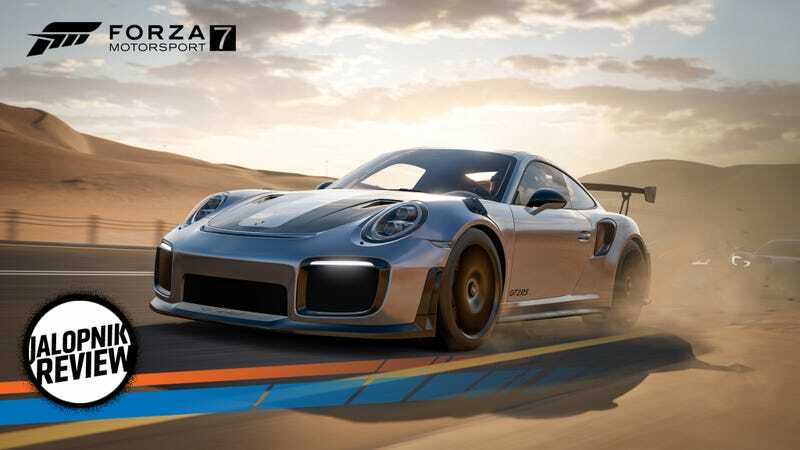 As the seventh installment of Turn 10's racing simulation, Forza 7 offers 32 tracks and over 700 cars to choose from, a leap from Forza 6's 26 tracks and 460 cars. While 460 cars sounds like a lot, it got stale surprisingly quickly, which was one of my major gripes with 6. Forza 7 is more “humanizing” than previous versions: you now get to win or buy Driver Gear, which are just different race suits, helmets and livery you can dress your driver in. It has no effect whatsoever on your game play, but after you finish a race and you can see your driver standing next to your car and waving at you, looking fly as all hell, it’s kind of nice. And perhaps the biggest update the game has to offer is the dynamic weather feature. Weather was introduced in 6, but it was static: you either raced the whole race in the rain or the dark, or you didn’t at all. In 7, pre-dawn can turn into day and dusk can slide into night. Rain can start in the middle of a race, forcing you to utterly change your driving style. Also making a happy comeback in Forza 7 is the beloved but fictitious Maple Valley Raceway, noticeably absent in Forza 5 and Forza 6. This was always my favorite track by far; this was the circuit I chose when testing out something new or benchmarking myself. Smooth, with long, sweeping corners and a downhill apex-tapping end stretch that feels like bowling a strike when you nail it just right, Maple Valley is as wonderful as I remember it to be. The deciduous trees lining the track are as lovely as ever, their fiery scarlets and golds stunning your peripherals as you speed past, your visual information fed to you at 60 frames-per-second. It’s not just Maple Valley that looks spectacular, either, by the way. The whole game is that way. Never before has the environment been so alive in a Forza game. It’s actually distracting. If your race takes place in the early hours of the day, pockets of mist drape across the tarmac. Winds, heavy with sand, snake beneath your tires at the Dubai City Circuit. Diffused and ethereal gilded rays from the rising sun shift across your field of view. In short, Forza 7 is beautiful. Did you really expect anything less? Admittedly, I didn’t have the game for very long before I had to start writing this review to make the deadline. Over the course of a few hours, I was able to test a few cars on different tracks and complete the first series of six in the game’s campaign. Here are my takeaways. The feel of the asphalt beneath your tires is noticeably sharper. If you aren’t careful, bumps in the road surface will jitter you off course. Hydroplaning is a very real thing. Traction, decisively, is inversely proportionate to how much rain has fallen. Audibly, too, the road’s condition will always be known: you’ll hear the constant rattles and shrieks of rocks being thrown against the body and tires warring for grip. If there were any improvements made to steering feedback, how hard the brakes bit, nose-dive under extreme braking or throttle response, I couldn’t tell. Tactile feedback like that was already so sharp in 6 that I felt little-to-no learning curve when I first fired up the new game. Perhaps this would be disappointing to some who would expect exponential improvements between this and the previous version, but I found the feel to be well balanced and still extremely realistic. And the game certainly encourages buying new cars and expanding your collection. Cars are now sorted into a Car Collection Tier system with five “tiers,” which you can level up by acquiring different cars. Each time you obtain a new car, your tier reputation increases until you can unlock the next tier, which gives you access to the next class of cars. Your race rewards are based on your Car Collection Tier. So, basically, the more cars you own, the faster you grow your Car Collection reputation and the better your rewards will be. The only issue I found with this system is that it takes a bit of time to unlock all the tiers. Before, as soon as you had the in-game credits to buy a car, you bought the car. Forza 7 is making me wait to buy my Lamborghini Miura. That said, in-game credits are easily earned, so you won’t be hurting for long after you make a big purchase. Forza 7 can be as easy or as difficult as you want it to be. Like the games that preceded it, you can change your difficulty settings and the aggression of your opponents. So, you can come in first, with ease, every single time. Or, you can really fight for it and sometimes not get it. I never finished the campaign in Forza 6. Truth be told, it was because I kept getting discouraged during the rain-only races. The grip never felt proportionate to how much it was raining and I honestly just got tired of fishtailing. Now, with newly inconsistent weather and heightened traction, I may just play this one all the way through.